An upset in the opening round at the expense of Hong Kong; it was exactly the same at the quarter-final stage of the Under 21 Men’s Singles event at the Seamaster 2017 ITTF World Tour Platinum, Hybiome Austrian Open in Linz later in the day on Tuesday 19th September. Deni Kozul, the no.22 seed, who had beaten Ho Kwan Kit, the top seed, in the opening round, continued his quite outstanding run of form. He overcome Ng Pak Nam, the no.8 seed (12-10, 8-11, 11-6, 11-8) to reserve his place in the penultimate round. 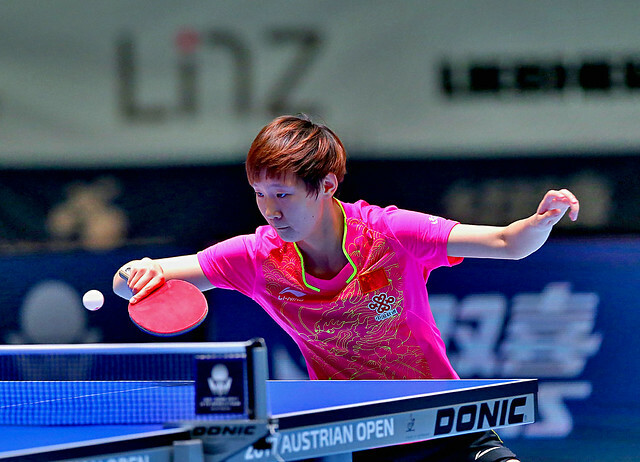 Success contrary to seeding, it was also success contrary to history; they had met in the second round of the Under 21 Men’s Singles event at the 2016 ITTF World Tour Croatia Open, on that occasion, Ng Pak Nam had won in three straight games. One upset according to seeding at the quarter-final stage of the Under 21 Men’s Singles event, there was arguably one more; Xue Fei, the no.7 seed, beat Niu Guankai, the no.4 seed, by the very narrowest of margins in an all Chinese battle (11-8, 7-11, 6-11, 11-8, 11-9). Contests between players from the same national association are often difficult to predict but on their one prior meeting, the 2017 China Junior and Cadet Open staged earlier this year in Taicang, in the quarter-final round of the Junior Boys’ Singles event, Xue Fei had prevailed in six games. Wins contrary to status; in the two remaining last eight duels, precedence prevailed. Kazakhstan’s Kirill Gerassimenko, the no.6 seed, accounted for Frenchman Alexandre Cassin, the no.13 seed, in a full distance five games duel (7-11, 11-5, 11-7, 10-12, 11-8); rather more comfortably, Korea’s Cho Seungmin, the no.2 seed, ended the hopes of Hungary’s Adam Szudi, the no.19 seed (11-4, 11-9, 13-11). Notably for Kirill Gerassimenko it was a reversal of his one previous meeting against Alexandre Cassin on the international stage. In the Junior Boys’ Singles event at the 2014 French Junior and Cadet Open, Alexander Cassin had prevailed in five games. At the semi-final stage Deni Kozul meets Xue Fei, Kirill Gerassimenko opposes Cho Seungmin. Play in the Under 21 Men’s Singles event continues to conclusion on Wednesday 20th September.